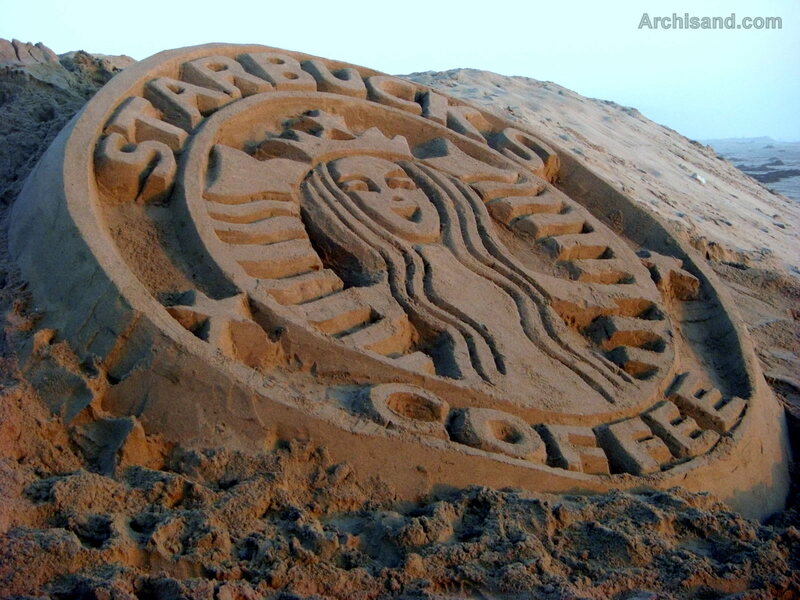 Sandcastle Marketing – Archisand Professional Sand Sculptors, Inc.
You’ve got the product, the service, the employees, the know-how. You’ve got an upcoming event that’ll be packed with influential people from your industry. You know how to hold their attention, but how are you going to draw the powerhouses and prominent faces to your exhibit initially? Add the “WOW” of live performing artists! Or shall I say architects? 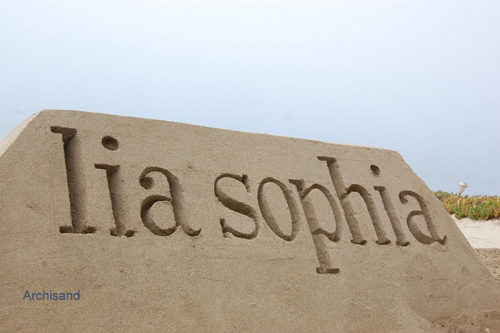 Archisand is the professional team of sand sculptors that can catapult your business to a whole new level. How? 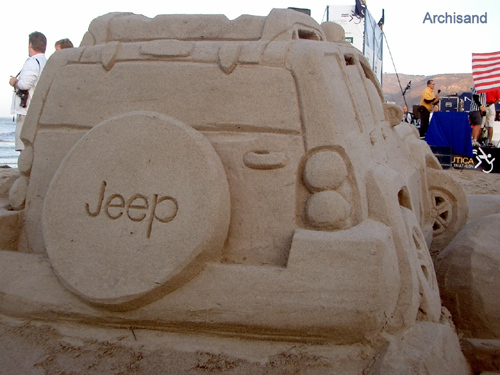 By creating awe-inspiring professional sand sculptures and sand castles that your guests and clients will be thinking about and discussing for a long time to come. Now add the staying-power of your product or service, and we’ve got a match made on a heavenly beach. 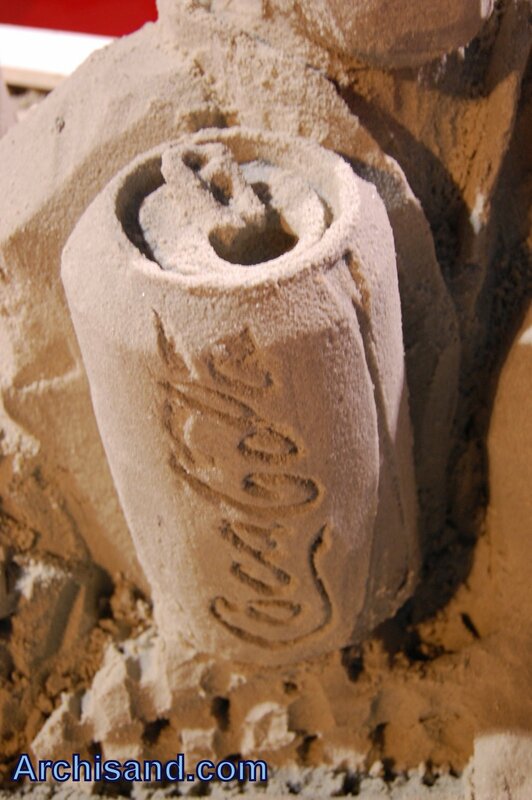 How to Create Buzz with your New Products & Services Using Sand? Whether it’s a company outing, award/induction ceremony, a convention, expose, celebratory business event, exhibition, or exposition – the goal is not only for your brand to be seen, or even remembered – rather you want it to be though of often – at the forefront of peoples’ minds! Our final product and the (process of creating it) is truly something to remember. In fact, it is difficult for people to soon forget– and your business can be the subject at hand! If brand recall or recognition is your goal, we’ll do you one better and create “brand buzz”! People will be talking, tweeting, and texting with everyone in their network about how inspiring it was to watch the Archisand team in action. Add your message to the subject of conversation! We’ll even provide a photographer to help spread the message…. 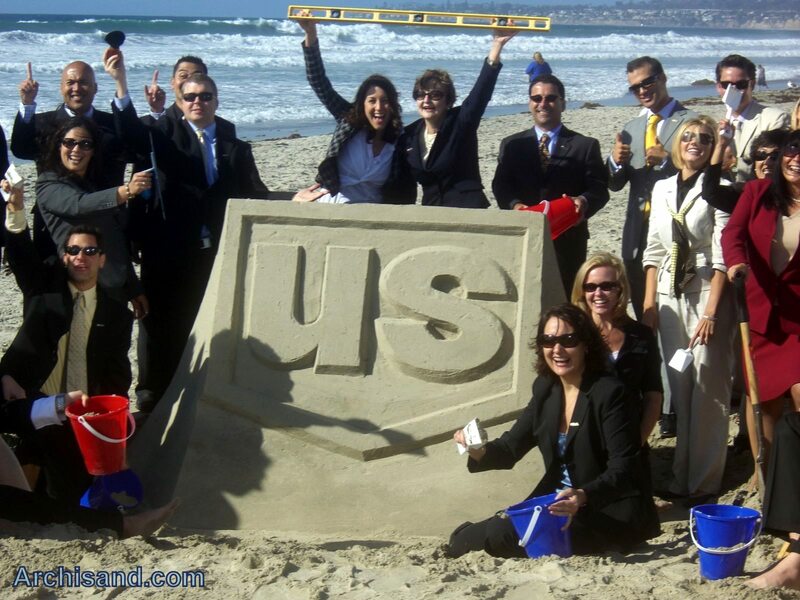 Why Get a Sandcastle for your Corporate Event? Choosing our team to represent your ideas let’s your peers and clients know that your company is innovative, forward-thinking, creative, and not afraid to be daring! The building of our sculptures takes planning, creativity, discipline, faith, and teamwork. Watching this process in action causes reactions in people that range from inspiration, anticipation, curiosity, intrigue, disbelief, excitement, and happiness! Its truly a crowd-puller…..
Our designers will be happy to work with you at depicting your brand or service, and you’ll be happy you chose us to create awe-inspiring sight with your brand as the focus! Who wouldn’t want their company logo to be the focal point of a convention? 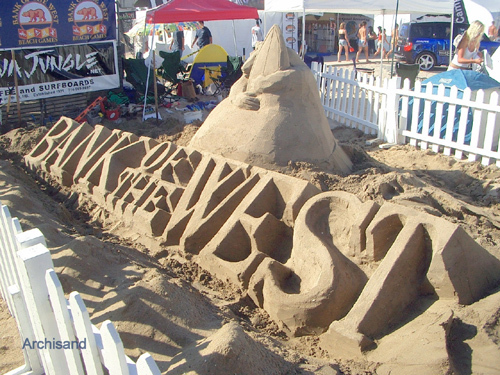 Whether the event is on a beach or on expo miles from the nearest ocean, our sculpting team will produce a head-turning sand sculpture of your merchandise or service. We can create a replica of your product(s) or design something that’s representational of the services you provide. We’ve also created lettering and design-based sculptures- company logos, trademarks, and slogans. Perhaps what you’d like to showcase is a little more abstract- don’t dismiss it as impossible! We can help you brainstorm a design that best embodies the message or idea you’d like to market. Go Ahead, Break The Ice! While we support all other artistic ventures, it is difficult for us to think of any other three dimensional art with a “wow-factor” or a “fun-factor” quite like that of Archisand’s! Ice sculptures have been done time and time again… quite frankly, we think they’re old news. Conversely, our innovative sandcastles spark interest and tend to make excellent conversation-pieces They’re effective “ice-breakers”, if you will, that to get people talking about whatever you’re marketing! Choosing our team to represent your team tells others that you are innovative, forward-thinking, creative, and not afraid to be daring! Our service is truly something to remember – and isn’t (brand) recall and recognition your goal? The Medium and the Mind – It’s been said that sand evokes the senses and conjures up fond memories in many people. The sight, smell, and sound of sand can be powerful tools that involuntarily cause recollection of family vacations, sunny days, the tranquility of the ocean, a warm breeze, fresh lemonade, salt water air, the smell of suntan oil, and the innocence of childhood. Most will subconsciously feel secure, serene, and even nostalgic without even realizing why, and that is definitely a feeling any company strives to associate with their brand. Who would want to walk away from those warm feelings? Now imagine coupling that with the excitement of a live performance, the creation of a sandcastle, and the presentation of your company’s product? We Draw a Crowd, You Take the Show! Archisand can accommodate your wishes with regard to how much or how little of your creation will be done during set-up (before your marketing event actually begins) and how much you’d like to be done in front of the crowd that you’ll surely draw to your exhibit. While the finished product will be awe-inspiring, do not underestimate the power of a live performance! Much of our crowd-appeal lies in the energy that goes into our work, so we recommend leaving some unfinished portion to be completed live. Our spunky team of creative professionals will grab the attention of your audience the moment they approach the sand! We will answer questions and interact with the audience if you wish, and you can take over the show at any time. We’ve accommodated a variety of clients from all types of industries. We’ve catered to companies of all sizes and types, and we will travel any where in the world to perform. We supply the sand and the tools, and we’ll work with you to decide the details based on your needs. Contact us today to book a consultation! It was an incredible display and we were very pleased with the sculpture. The public absolutely loved it.